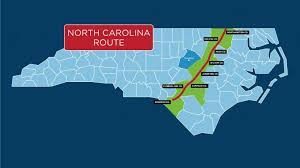 Currently this project is running about a year behind schedule but the Atlantic Coast Pipeline has begun suing land owners in Federal Court in North Carolina. The Atlantic Coast Pipeline is a large Energy Consortium that is led by Charlotte Based Duke Energy and Richmond based Dominion Energy. The consortium has the power of eminent domain allowing them to take the property and easements necessary to construct the pipeline across private property. Once complete the pipeline will be 600 miles long. It will be constructed underground. The pipeline will cross roughly 2,900 privately owned properties in eight (8) counties in Eastern North Carolina from the Virginia border to the South Carolina border. In addition to obtaining easements to construct the pipeline, the consortium will also need to retain ways to legally access all areas of the pipeline for maintenance and repairs. According to recent press releases, land owners will be able to grow crops over the easement area. However, no trees can be planted above or within a certain distance of the easement and no structures can be built over the easement. The permitting process is still ongoing in North Carolina; however, the project is far enough along in federal permitting to allow the Eminent Domain and Condemnation process to begin. This process has already started and it is estimated that potentially hundreds of claims will be filed in the next few months so that the consortium can move forward with construction of the pipeline.